A beautifully hand crafted by skilled artisans in India. 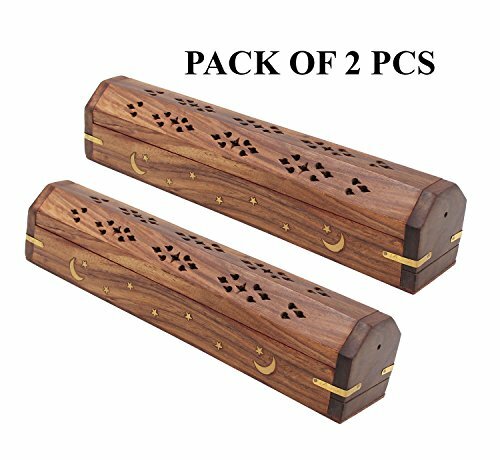 Store your incense sticks and cones in style. The top portion is used to hold & light the incense sticks, and once lit, the lid can be closed and placed anywhere in the room. As the incense burns, residue is dropped on the tray, while the freshness and fragrance of the incense sticks quietly seep through the wooden passageways and encompass the room in which the burner is placed. BURN INCENSE WITHIN SIGHT, NEVER LEAVE UNATTENDED OR NEAR ANYTHING THAT CAN CATCH FIRE. KEEP OUT OF THE REACH OF CHILDREN AND PETS. If you have any questions about this product by Dharmaobjects, contact us by completing and submitting the form below. If you are looking for a specif part number, please include it with your message.